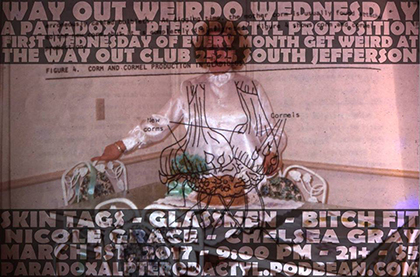 Way Out Weirdo Wednesday continues to deliver on its namesake with mixed lineups on the first Wednesday of every month. Booker David Bell combines the inanity and diversity found in his Paradoxal Pterodactyl podcast for a live show that mingles with punk, hip-hop, folk and all things experimental. By twisting and bending common punk idioms with math-rock structure, Anybody But the Cops comes off as an unpretentious pusher of odd time signatures and busy riffing. The band's penchant for musical in-jokes would feel insular if not for its inherent humor and overall approachable vibe. Jeremy Harris, the brain behind Lazy Magnet and Xerome, offers up his latest endeavor as the synth-fueled Charles Allin. Expect a low key and ambient night headed by a touring artist with more than twenty years experience in the game. Kalamazoo-native Erik Nervous hides a frenetic alter ego inside otherwise unsuspecting punk-rock songs that last roughly as long as a microwave takes to heat up day old pizza. Times Beach/Military Police frontman Mark Plant has returned to St. Louis after living in Chicago for several years and will perform under his "Mark Plant Solo Noise Project" which is song-based -- regardless of what the name might imply.